Egg rolls with amazing flavor, without the carbs! A one pan dish, perfect for a tasty low carb meal. Diabetic friendly and keto approved! If you like egg rolls, these unstuffed egg rolls are amazing! I just love Chinese food but it’s not healthy to eat! This is a great low carb alternative! I love Chinese food and the egg rolls are the BEST part! They’re so good but not part of my keto lifestyle because they are so unhealthy with so many carbs! That’s why my new dish is called unstuffed egg rolls. AMAZING taste without all those carbs! This recipe is so good!! Put it on your menu this week and it will quickly become of of your favorite dishes! It is very quick and simple to make and turns out wonderful every time! If you want to save some money you can shred a head of cabbage to make this. Or to save time, just use the coleslaw mix you buy in the bag to make it quicker. Another thing I like to do is use a spicy, ground sausage mix, or even add some extra spices myself. This is another dish that you can really make your own and add whatever you like to it. 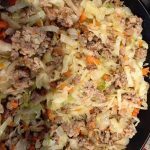 My family loves this meal and it is great for left overs the next day if you make extra. Also great for a delicious lunch the next day. I even put this in a thermos for my daughter to take to school the next day, she loves it. Perfect to take to a pot luck as everyone always raves about this when I take it somewhere. I always get asked for the recipe and it’s one of my most popular. This is another great example of how eating low carb or a ketogenic lifestyle is so easy to do! Make a favourite recipes or food into a new dish everyone loves! If you like egg rolls, these unstuffed eggrolls are amazing! I just love Chinese food! Not all the time because itâ€™s not healthy. You are the BEST! Thanks for all you do! I use ground turkey and its good that way as well! Yum! Great tip about the Peanut Butter. It added some great flavor! Yum!!!! A family FAVORITE…I add sliced mushrooms and one onion diced. Thanks so much for sharing healthy alternatives. Used ground chicken and sesame oil! Yum! Wrap it in Boston leaf lettuce. I use ground Turkey. I put a bit of Olive oil in the pan to cook the Turkey. The recipe I have also calls for a Tablespoon of Soy Sauce. Yum. I love egg rolls, but am cutting carbs. Sounds like a great alternative to the traditional egg rolls. I’m diabetic and need some low carb recipes. Thanks for sharing! 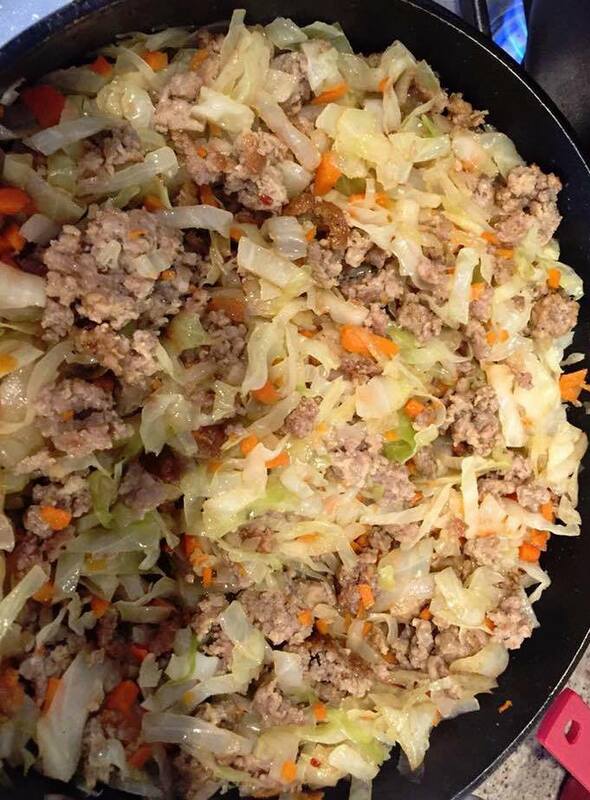 Lean ground beef, onion, shredded carrots, and soy sauce.